Just wanted to thank you, Jamie and all the other tutors at HONDA-we found out yesterday that our son was accepted into Punahou! I know he could not have done this without your expert help and guidance so please accept my sincere thanks!!! I know there are other tutors out there, but I truly appreciate that you really care about the students and don't just put them through the paces. Keep up the good work, and I will be sure to recommend everyone else I know that needs tutoring. 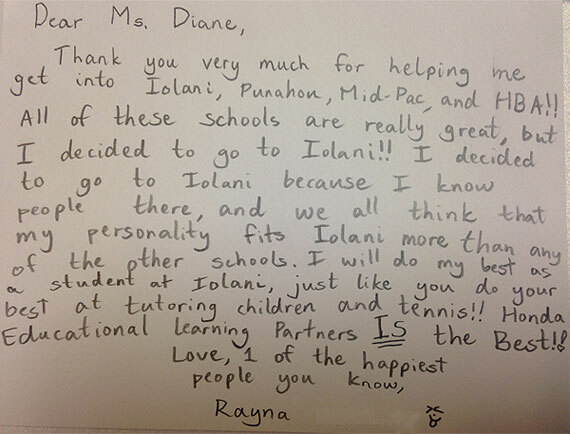 Got some great news and just wanted to extend my deepest gratitude for all your time that you put into helping Tanea with preparing for her SSAT testing, Kamehameha, Iolani, and Punahou testing and interviews!!! Tanea got into both Iolani and Punahou and is on the wait list for Kamehameha! Please know that your work is greatly appreciated!!! "We recommend HELP without a reservation. They are amazing, and I cannot say enough about them, especially Diane who is one of the kindest people I've ever known. Our son loves going there because it is a nurturing and comfortable setting for him to learn. Their highly skilled tutors have taught Logan how to gain extra traction in his ongoing lessons. They do whatever it takes, including crawling under the table with him to build blocks. 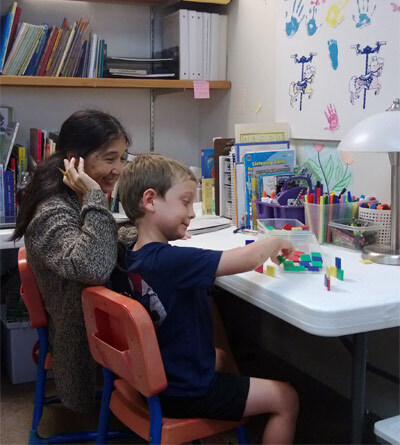 From a parent's perspective, I've really appreciated the opportunity to set in the next room and listen to the way the tutors bring out the best in our son. He's not the only one learning; we're learning as well. We're learning how to ask the right questions, pique his interest, and make learning a fun time for the whole family. Not every parent is a good teacher, so this has been so helpful to our family to learn how to encourage Logan to do his homework. We really appreciated the baseline testing that showed us where Logan needed to focus. They worked with us to bring him up to speed. He has really grown. Logan is a typical boy who doesn't like to do homework, but he looks forward to going to HELP where he can explore the many educational games, books, and puzzles they've got. He always sneaks into the back to say hello to the resident bunny (and turtles). After his sessions, he sometimes gets a treat from the giant treat bin which sends him home very happy. We're so grateful that so many of our friends recommended HELP to us. 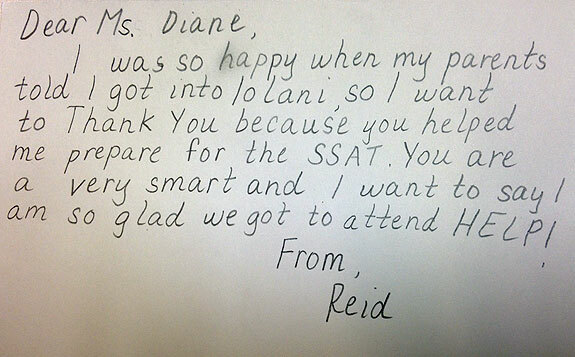 We wouldn't have found it any other way because we weren't necessarily looking for a tutoring service. But, when our friends told us how much they liked HELP, we gave it a try. They exceeded expectations and continue to do so." Thank you very much for all your accommodations you gave my sons and I this year. The excellent tutors, special rate and flexible schedule were incomparable. I can see an increase growth in their learning and a stronger commitment to the process. I am grateful and hold you and your staff in high regard. We shall return and until then take care and God bless. H.E.L.P. has been in business for the last 16 years. In this time H.E.L.P. has nurtured many to find success in their educational journeys. What percentage of H.E.L.P. students got in to their school of choice?